Mashed potatoes. Everyone likes them, right? But some days, plain old mashed potatoes just won't do. Potatoes are great as a blank canvas to be creative with various ingredients. Spices, fresh or dried herbs, cheese... even horseradish can give regular mashed potatoes a nice boost of flavor. Tonight, I prepared the following recipe to pair with Sweet Italian Sausages and balsamic braised onions. The tang of the horseradish really is a nice change of pace! Place the quartered potatoes large pot and cover with water with a pinch of salt. Cover the pot with a lid and bring the water to a boil. Take off the lid and and boil the potatoes until tender, about 10-12 minutes. Drain the potatoes and return them in the hot pot to the warm stovetop to dry them out. Heat the butter and milk in the microwave and add to the potatoes. Add the sour cream and horseradish, then smash to your desired consistency. Season the potatoes with salt and pepper to your taste. Stir in the parsley and serve warm. I love mashed potatoes and will try these! I love horseradish and potatoes! Yum! 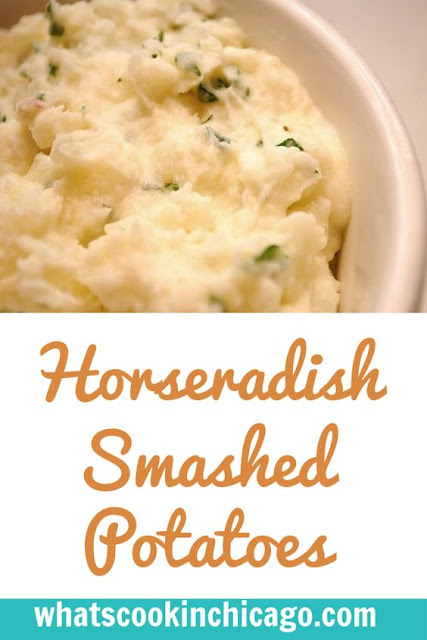 I like the idea of adding horseradish to mashed potatoes!